Watch these short videos to understand the POWER of the new PBM AAH Light! Photobiomodulation (PBM) is the term of choice used to describe the mechanistic/scientific basis for this light application and Photobiomodulation Therapy (PBMT) as the term for its therapeutic application. Over the years, the medical community has struggled with consistent terminology regarding this therapy. Several terms such as Biostimulation, Cold/Cool Laser, Low Level laser therapy (LLLT), Soft Laser and Low Power Laser Therapy have all been used to describe this application of light. Based on recent consensus in the field, PBM and PBMT are now considered the terms of choice. Get fast pain relief with your own PBM AAH Light! What do you use PBM for? In this therapy, a light source is placed near or in contact with the skin, allowing the light energy (photons) to penetrate tissue where it interacts with chromophores located in cells. This interaction results in photophysical and photochemical changes that lead to alterations at the molecular, cellular and tissue levels of the body. Light induces a complex chain of physiological reactions in diseased and damaged tissues to accelerate wound healing and tissue regeneration, increase circulation, reduce acute inflammation, reduce acute and chronic pain and help restore normal cellular function. Interestingly, recent research indicates that light can enhance performance in normal tissues and cells. Photobiomodulation (PBM) Therapy uses red and near infrared (NIR) light to reduce pain, inflammation and edema, and drastically aid recovery. PBM therapy works at the cellular level, stimulating repair and normalizing cell function. Acute injuries and inflammation from muscle strains and sprains, cuts, bruises, burns, etc. typically show very rapid improvement and can resolve in 2-4 treatments. Long-term, chronic conditions can take as little as 12 sessions to see significant benefits. Minimum interval recommendation is 2-3 times per week until your goals are met, then 1-2 times per week for ongoing maintenance. For individuals who exercise frequently or at high levels, 3-5 times per week is recommended for optimal recovery. The AAH PBM light device delivers only red and near infrared wavelengths. These are non-ionizing wavelengths, meaning they do not damage cells, but stimulate repair. PBMT does not heat tissue, it does however increase circulation so a warming sensation is often experienced. 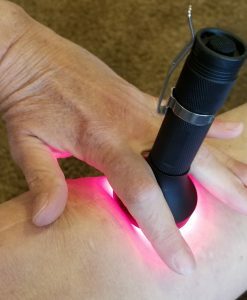 The AAH PBM light has a surface area 10 times larger than the standard AAH Light and is intended for faster relief of joint pain, wound healing and working with larger body areas. This exciting light incorporates 9 super red LEDs, 3 near IR LEDs and a 40Hz optimal healing frequency. According to a study at MIT, 40Hz produced the best results over other frequencies, ranging from 20 to 80 hertz. 40Hz is gamma frequency which is present while your brain is consolidating memory, helping it to minimize or prevent overactivity. Solid red releases tight muscles, accelerates healing new wounds, opens energy when tracing the meridian lines. A combination setting includes the near IR and therefore will penetrate deeper for joints and muscles. This powerful setting is reserved for the older, deeper and tougher issues we encounter. The PBM settings advance with a gentle tap of the toggle switch, just as you do with the standard AAH Light. It is not necessary to push so hard you hear the “click”. PBM light and head are designed to be compatible with the existing AAH Light base and battery. PBM devices have been cleared for marketing by FDA through the Premarket Notification/510(k) process as adjunctive devices for the temporary relief of pain. This is crazy Aahmazing®! I can't wait to receive my own PBM AAH Light! Non-mammalian Hosts and Photobiomodulation: Do All Life-forms Respond to Light? You had me at "Healer", I am ordering my PBM AAH Light right now!